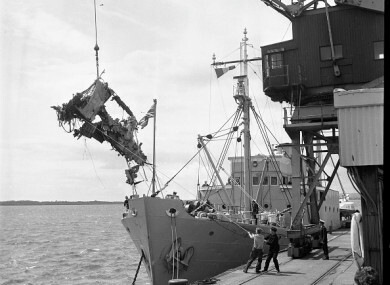 Landing of the wreckage at Rosslare Harbour in Wexford in March 1968. TODAY IS THE 50th anniversary of Ireland’s worst ever air disaster. Just after noon on Sunday 24 March 1968 Aer Lingus Flight 712 from Cork to London Heathrow crashed off the Wexford coast. Of the 57 passengers, 35 were Irish, nine were Swiss, six were from Belgium, five were British, and two were American. Only 14 bodies were ever recovered from the scene and the cause of the crash has never been determined. The flight took off from Cork Airport that morning at 10.32am for London. Later, in a garbled message it is indicated that another aircraft was in the area. The plane eventually went down close to Tuskar Rock. There was no black box recorder on the plane. Questions have abounded as to how the flight went down, with a popular theory being that an RAF missile was responsible for the crash. “The conclusion that there was another aircraft involved is inescapable,” investigator Richard O’Sullivan said in his report, which is responsible for much of the speculation. No aircraft have been reported missing, but there remained the possibility that an unmarked aircraft, either a drone aircraft target or a missile, might have been there. The most popular theory is that the St Phelim was hit by a rogue missile fired from a nearby missile testing range. The Royal Aircraft Establishment’s range at Aberporth in Dyfed in Wales was at the time the most advanced missile testing station in Britain. A crewmember from the HMS Penelope later alleged that part of the wreckage was recovered by his vessel. Yet another theory states that the plane was hit by a pilotless drone. Compounding all these issues was the fact that serious problems were reported with the search and salvage operation, which was carried out by the Royal Navy. It took 70 days to find the wreckage of the aircraft, despite several reports pointing to where it was finally discovered. Further adding to the confusion was the fact that a 2002 review by the Air Accident Investigation Unit found that paperwork relating to a routine inspection of the aircraft carried out in 1967 was missing. The issues with inspection of the aircraft refocussed theories onto its maintenance. Still to this day, there are no definite answers as to what happened. The AAIU investigation reported that a structural failure of the port tailplane metal fatigue, corrosion, flutter (vibration in a control surface which may cause control difficulty and lead to a structural failure) or a bird strike may have been the cause. The disaster will be commemorated today in Rosslare, Co Wexford, where a wreath-laying event will take place at the crash spot. Relatives will be taken to the site by the Irish Navy and a ceremony will be held later. A commemorative mass will also be held in Sunday in Cork. Read: Can you help identify a victim from the 1968 Aer Lingus plane crash? Email “50 years on, mystery still surrounds Ireland's worst ever air crash”. Feedback on “50 years on, mystery still surrounds Ireland's worst ever air crash”.